It’s been a few weeks since our last update and little has changed..or so it seems. The next “big” step in our kitchen remodel is building the cabinets. The plywood for the cabinet carcasses has been ordered and delivered. I went in with a fellow woodworker to purchase birch plywood at a significant savings from our locally-owned lumber company. I was able to save between 35-40% over the big box store’s price for hardwood plywood. The cabinet face frames and door frames will be solid hardwood, so I have secured a generous amount of poplar. It was originally rough-faced and extra thick, but in the past week, I’ve planed (thinned) it down to 7/8″. After letting it “rest” for a few days, I’ll finish planing it to the final 3/4″ thickness. I honestly don’t know if it is necessary on kiln-dried lumber, but “rest”ing is a procedure in which you have removed material from both sides of a board, getting close to the desired final thickness. In consideration of moisture content in the wood, you allow the newly exposed faces of the wood to acclimate to the humidity. It is possible that some cupping or twisting of the board could occur as the wood dries out. Waiting a few days before planing the final 1/16” from each side will help insure a straighter, more square board in the end. White looks good on the inside, but not so good from the outside of the house. The windows were delivered and installed with little fanfare. On the morning of the professional installation, I took off work to “assist” the installer and learn the procedure. 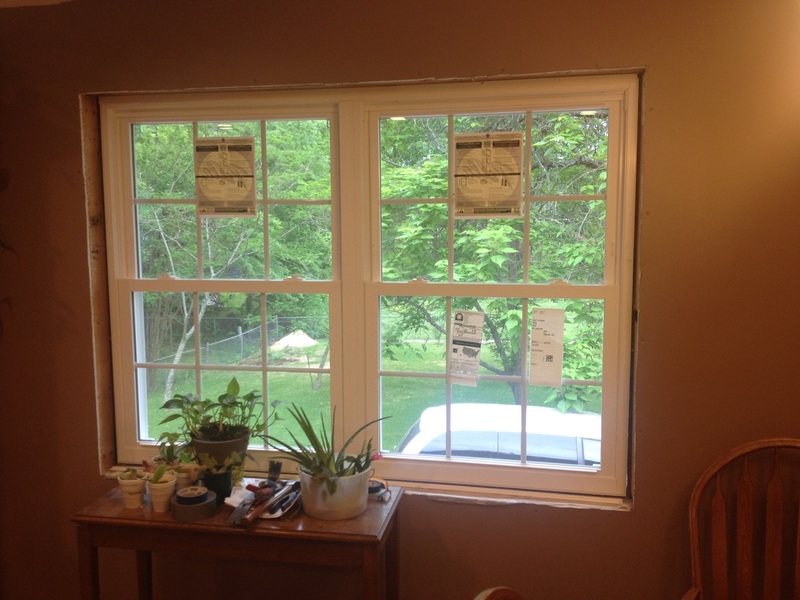 We are only replacing four of the 17 windows in the house during this remodel, so learning how to install them myself will save lots of money in the future. The installer was patient and very willing to teach me the tricks of the trade. I was surprised at just how simple the process really is. Once the installer left, I walked outside to get an overall view of the work. I was so engrossed in learning how to install them, I had not noticed…they were the wrong color! We had ordered almond color and the salesman had written down almond on the contract. However, when he ordered the windows, he chose white. We are currently waiting on the new windows to arrive…again. Hey, a free refresher window installation lesson coming my way! Most of the lights are in place. Another area almost complete is the lighting. 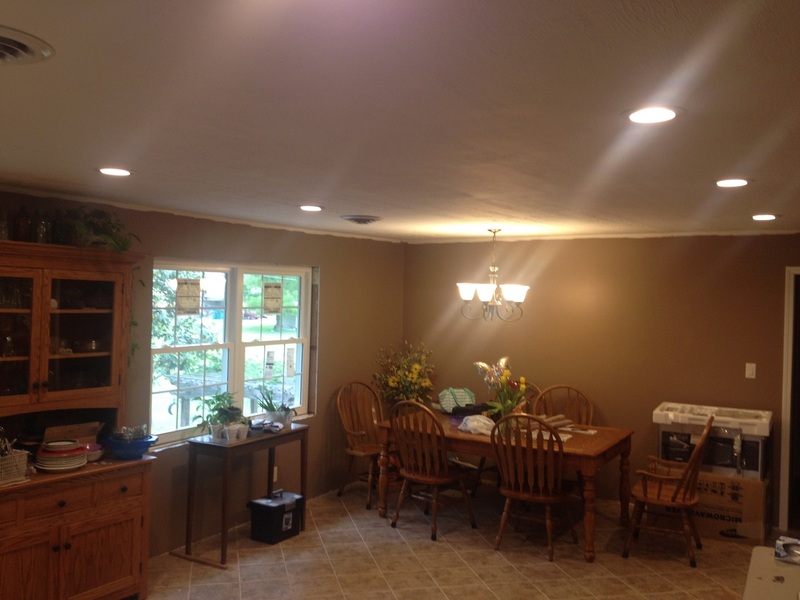 The light over the kitchen table has been installed, along with the recessed lights. Mrs. Sawdust Inn had chosen her light fixtures for over the island and the sink, but the saleslady had tipped us off to an upcoming 30%-off sale, so we delayed our purchase for a couple of weeks. They have been ordered and should arrive soon. Except for the main bank of recessed lights, all of the lights are on separate switches for energy savings. 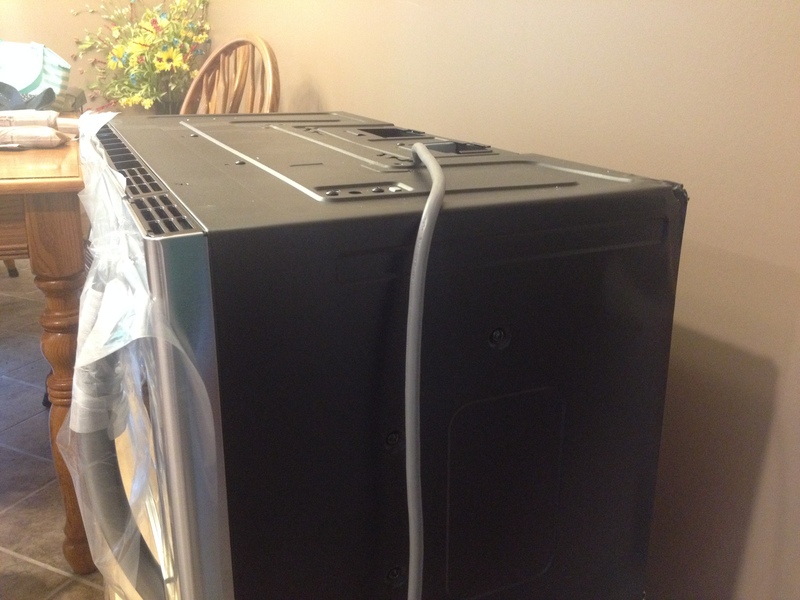 A slight dent on the back side, but this microwave will be installed in a cabinet and the dent hidden. We got a 75% discount off the retail price! Our local Lowe’s is the central hub for selling “scratch and dent” and “floor model” appliances from all the Lowe’s stores in our tri-state region. They get new shipments on Tuesdays. So…every Tuesday evening we peruse the appliance section for the latest arrivals. So far, we’ve collected a clothes washer and a microwave oven for dimes on the dollar. The damage is on the back or side of the appliances, will not be seen, and has no affect on the operation of the machine. Plus, it still comes with a warranty. In addition, the discount is relative to the amount of time the appliance has been sitting in the store and to the amount of “perceived” damage. The longer is sits unsold, or the bigger the dent or scratch, the lower the price goes. The bottom line is…you can get new appliances at a great discount if you can simply settle for less than perfect. Below is a current look at the room. Happy Woodworking! Start with the first blog in the Kitchen Remodel series here. Be the first to comment on "A new Kitchen – Part 7 – lights, windows and an uh-oh"